Well, the weather luck has ran out for this year’s festival. As it turned out, there was little actual precipitation, but the threat of thunderstorms over the weekend was enough to thwart the plans of some would be participants. 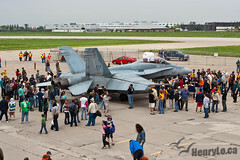 Nevertheless, the stars of the show, including the CF-18, CH-146 Griffon helicopter, Harvards, and Discovery Air Canadair Sabre in Golden Hawks colours were there to greet the huge crowds on May 28-29, 2011! 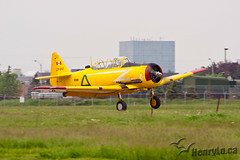 The weather didn’t deter some interesting arrivals, including a Titan T-51, a kit airplane built to replicate the venerable P-51 Mustang. A Global Express XRS business jet from Bombardier next door was also on display. 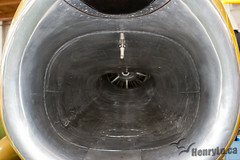 Inside the big hangar, I got a good look at the Sabre’s intake. Some poor sap must have spent hours polishing that, but it looks amazing! From what I heard, a few exotic vehicles I missed include a vintage Ferrari, a fire truck in action, and a 3-wheeled Raleigh automobile. There is always next year!